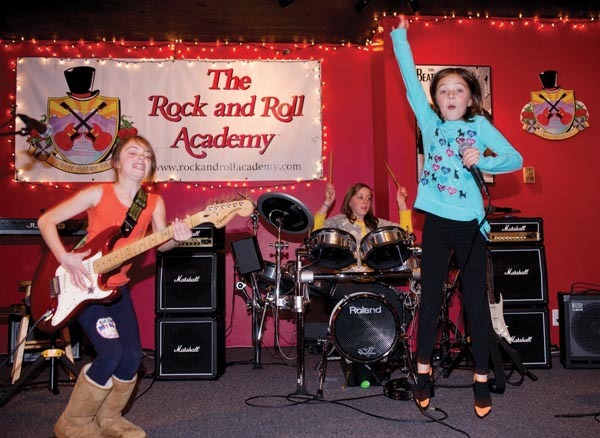 ASPEN – If Russell Cattaneo, director of the Rock and Roll Academy, were to operate like the typical music teacher, the upcoming Second Annual Winter Rock Concert would include performances of “Smoke on the Water” and “Secret Agent Man,” songs that generations of music teachers have faithfully relied on as teaching vehicles. But Cattaneo’s philosophy is that music education should be kid-driven: Kids should pick their instruments. They should make some noise on the axes and drums right away, even if they don’t know how to play a chord or keep a beat. And they should definitely be allowed to pick the songs they are going to learn. So the Winter Rock Concert, set for 7 tonight at the Wheeler Opera House, will have musicians ages 6-13 playing songs Cattaneo would never have picked: “Moves Like Jagger,” by pop band Maroon 5; the joking “The Duck Song,” a children’s story set to music; or “Black and Yellow,” by Wiz Khalifa – Cattaneo isn’t sure whether Wiz Khalifa is the name of a band or a person. Choosing a repertoire is one of the first things the students at the Rock and Roll Academy do, and it is one of the most valuable and significant. For one, it sets the kid-friendly mood: Students won’t be struggling to learn a song completely unfamiliar to them, as Cattaneo did when he was growing up in Arkansas. Allowing the kids to pick the material lets Cattaneo know where their interests lie (usually in pop-oriented music, with a bit of not-too-heavy metal and light hip-hop thrown in). And it gets the students working not only on learning music, but also the bigger-picture things, like teamwork and democracy, that Cattaneo seeks to incorporate into the experience. Picking the songs also lets the kids begin to develop their musical personalities in a meaningful way. “Free Bird” might mean everything to the middle-age guitar teacher; for an 8-year-old, it probably pales in comparison to learning Bruno Mars’ “The Lazy Song,” a tune that will connect with their friends. Over 12 weeks, with one 90-minute session each week, Cattaneo’s 32 students have been building the repertoire they will exhibit in a free performance co-presented by the Wheeler Opera House. The songs include contemporary pop (Black Eyed Peas, Coldplay, Foster the People, Jason Mraz), older hard rock (Scorpions, Kiss, Twisted Sister), and a pair of Beatles songs. In some ways, the list mystifies Cattaneo. Probably as much fun for the Rock and Roll Academy students as choosing a song is choosing a band name. This semester features Roadkill (for the youngest kids), the Future Dictators (8- to 9-year-olds), P.O.C. (an acronym for “Piece of Cake”), I.C. Rock, Rewind and Poster People. But Cattaneo says picking the songs is a far more significant process than taking a name. The songs are what they work on; the songs are what will inevitably bring up issues of musicianship and personalities.